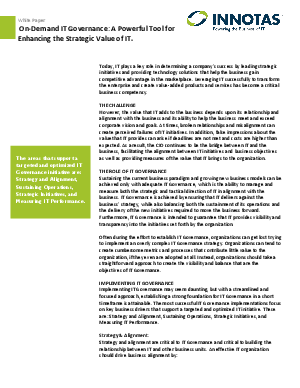 > Innotas > On-Demand IT Governance: A Powerful Tool for Enhancing the Strategic Value of IT. On-Demand IT Governance: A Powerful Tool for Enhancing the Strategic Value of IT. In IT today, it's all about strategy - that is, fully aligning all IT efforts and resources with the objectives of the organization. Review this white paper now and learn how and why IT Governance is the best path to achieving this critical alignment. It presents the key business drivers in IT Governance and how on-demand can streamline implementation.